Phheeewwww, it's a long-awaited bank holiday weekend here in England! For me, not only does this mean that I get Monday off work, I also get Tuesday off because the organisation I work for likes to give us 'grace days' after each bank holiday Monday...nice! Though I do worry about just how elated I feel when I don't have to go to work, but that's normal right?!? Faced with any expanse of free time, I always hatch grand, unrealistic plans...like sewing myself a whole new wardrobe in 3 days, hehe! This time round I'm trying to set myself achievable targets and operate on a more chilled level. So far I've prepared some more precious collars for the sewing machine – your encouraging comments on my last post have really spurred me on! I also indulged in a spot of baking. I used to bake a lot before 'discovering' sewing, but nowadays it's taken a back seat, which is no bad thing for my waistline! Anyway, these delicious little things are carrot and cream cheese muffins (recipe can be found here) sans the cream cheese topping as I like to top each one just before it's going to be eaten. I followed the recipe fully, apart from the topping part – for mine I simply mixed cream cheese and icing sugar. Oh and I listened to the recommendations in the recipe's comments and added the orange juice too! 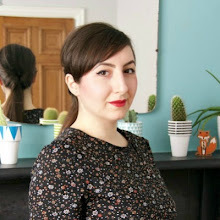 Finally, I've also been enjoying going through the patterns I recently won courtesy of Gina who blogs at Vintage Girl. Gina's generous giveaway was even more generous than I realised! When my package arrived there were even more patterns than I anticipated, alongside a lovely note. Thank you so much Gina, you're a great lady!!! I hope fellow UK residents are also enjoying the bank holiday, despite the less-than-summery weather! Speaking of weather, I also hope that people located along the east coast of the US are safe and sound following Hurricane Irene. I'm relieved to have spoke to my aunty in Connecticut who is just fine apparently, hope all your loved ones are too! Yay for long weekends!! I can't wait to see your finished collars, they're already looking pretty (: Those cupcakes look delicious! It's a shame that I'm HORRIBLE in the kitchen, otherwise I'd attempt to bake them. Those are lovely patterns, I hope you use them soon! Looking forward to seeing your collars! P.S. No holiday in Scotland today - I am so tired of the radio telling me I should be enjoying myself! 'Grand, unrealistic plans' - snap! I'm sewing for a holiday in about a week's time, and stressing myself with over ambitious goals! Great collars - love that top left blue floral.